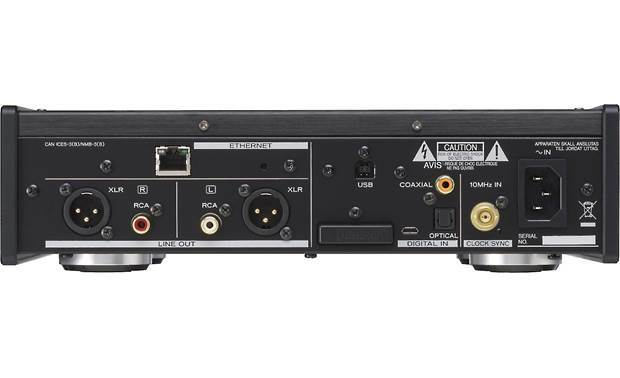 The NT-505 is a flagship dual monaural USB DAC with versatile network playback capabilities. It successfully incorporates the latest network technologies, along with TEAC’s decades of accumulated audio design experience, in an attractive package with an A4-sized footprint. Last edited by bobpaule; 02-23-2019 at 03:55 AM. Struggling with my new Bluesound Node 2i and Marantz HD-DAC1 combo. Love USB DSD and FLAC. Want Airplay around the house to my Marantz receivers but Bluesound falsely advertises the Node 2i as having Airplay2, on the support forum techs admitted it will be some time before they implement it, of course they did not alter the marketing on the website to reflect this. Additionally my first Node 2i has terrible distortion for high treble on RCA analog out which only ceases if I activate tone controls, reducing definition and separation somewhat. MQA convert here after I discovered Tidal and the wonders of dual MQA dual unfolding 350kHz/24bit/1600kbps using Android/UAPP with iFi-xDSD alimenting my beloved AKG K702s. I like BluOS and I am hopeful the TEAC has a similar or better interface via the apps as shown on the datasheet above. Can owners please chime in? How is the headphone stage? I am psyched, unit arrives today, got a trade in full MSRP for the HD-DACa and can still return the replacement Bluesound (love Amazon). The new Bluesound did what I call block spatialization, ie there is the middle, then void, then each speaker individually, none of the smooth gapless Dolby effect I got off FLACs from my PC. Last edited by bobpaule; 02-14-2019 at 02:16 AM. I haven't used used headphones with it, but the app is exactly the same as what Lumin uses. I had never used the Lumin, but its quite easy to use. Its not flashy or gimmicky .. just works. Like you - we had a bluesound node 2 (not the I). I was searching for a dual ak4497 streaming dac. I'd even been happy finding another dac with USB out, but that is non-existent. There isn't much available actually - strange really. I considered the Cary DMS600 (waaay too expensive for what it is) .. even considered the DIY route. I do wish it had a small color screen, but the phone app more than makes up for it. My fiance uses Airplay and honestly - I was called to work ... before we had a chance to use it. For now - shes been using Tidal exclusively. There was an update released which supposedly enhanced/allowed airplay, but I didn't have the time to update it. Spotify is also supposed to work (I'm not a spotify user, but just sayin). I am returning home on the 1st and will happily report my findings with airplay and the update if you'd like. Build quality is top notch and we much like the retro-ish/modern appearance. Everything just feels solid ya know. To sum it up - if my fiance .. which is technology challenged can operate the 205 with a marantz av8805 and dual carver 350 tubes ... its already a winner! It sounds fabulous! well - I also found out the NT505 doesn't like dsd/dsf files fed from the readynas 6 software. I attempted to work around it with a little shell knowhow, but chose to purchase a QNAP TS251+ with 2 12tb seagates instead. Minimserver is simple to install and setup ...Streams DSD like a champion. Looking through the crap ATT gigapower gateway I noticed the NT505 shows up as "Lumin." Interesting... My best guess is that Lumin and Esoteric/Teac share technology of sorts. Anyway - this is wired in via XLR to/through the Marantz AV8805. I can confirm airplay works flawlessly - as in simply hitting the little airplay icon and selecting the NT505. Spotify not only works, but sounds great (seriously lol). MQA works as advertised via Tidal. Its quite obvious the dual ak4497 DAC is quite stellar and IMHO sounds much warmer (if thats the proper term.. maybe natural and not so mechanical) than the oppo 205. I think at the list price its good buy for what you get. Sure - it could use a color screen, but the Lumin app is quite simple to use. There is a slight learning curve creating playlists, but it appears as if a hybrid list of whatever sources can be made and then played as desired. Timbernation is fabricating a tiger maple rack for us as I type this. Now that we have most everything needed it was time to have a nice spot for our gear. Last edited by love_that_sound; 02-03-2019 at 10:03 PM. I can confirm the 505 streams dsd128 and qobuz (I'm a beta user) hires without a hitch. The HR Streamer WiFi interface is a bit buggy, and the lack of a full PC or web based browser interface major omissions. There are no third party interfaces, no I am not paying for ROON. Sad really, as the hardware seems rock solid, the dual mono shines and after six hours of play the unit is barely even warm to the touch. The sound, OMG this is very good. It only decodes MQA over the network, not a huge issue. So far tested USB FLAC 192kHz JBRadio sounds much more detailed then on HD-DAC1. DSD files just like downstairs in the HT. Tested Tidal MQA all my favorite playlists, Jobim and all the other jazz numbers and the 120 or so Deutsche Grammofon items sound fabulous, Chopin like never before. The spatialization is nice with my ProAc Tablette 50s, the entire stage comes to life, bass is tremenduous from these tiny speakers, maybe also because the dynamic range is also improved. Have not yet had a chance to plug in the AKGs. No regrets. I even set TuneIn radio stations, this machine breathes life into plain radio, a simple talk show now is very detailed, tiny sound engineering details and errors come to life, the hosts and guests are localized well. Will tell more once the honeymoon is over. Honestly, I am having a hard time peeling away from my home office system past two evenings, things are so good here. USB-data-only-cable>NT-505>AQ King Cobra RCAs>Parasound Zamp v.3.2>Belden10AWG/silver/gold>ProAc Tablette 50s w. silver wire jumpers. Last edited by bobpaule; 02-16-2019 at 03:32 AM. LUMIN is the winner for me as it displays the MQA logo by the song, crashes less predictably, and it is also version 2.01 vs the TEAC and Esoteric 1.0. Last edited by bobpaule; 02-16-2019 at 03:27 AM. I'm not into using odd phrases, but my fiance commented on the music via qobuz using words like separation and space. This device is great for real! Its important to note that I have NEVER influenced her taste or perception of music. I play some music and she plays some music. Tonight - she took the IPAD out of my hand and was really into it. I'm not trying to plug qobuz, but she's been able to identify the hires emblem and prefers to find those albums. Her and I just finished a 2 hour listening session - mostly 80s-90's country (some modern). We were both amazed by how clean and new the music sounds. I've listened to a long long laundry list of "dumb dacs" (i consider a dac without network function dumb) .. and auditioned many network streamers. The dual ak4497 is legit. I can't say I've used the usb input (I likely never will). The bluetooth works fine/flawlessly, but that was just for her. Airplay works great as well, but we really don't have a need to use it. I will say - to get the most out of the app and the GUI .. use a tablet. Lastly, I can't really comment on the NAD, but looking at the hardware .. its not even close. I guess it really comes down to what you want it to do? Last edited by love_that_sound; 02-18-2019 at 09:07 PM. ......Lastly, I can't really comment on the NAD, but looking at the hardware .. its not even close. I guess it really comes down to what you want it to do? Everest 6700's? My brutha from another mother.. I currently stream froma MacBook Probook >Audnirvana> Tidal. It sounds great witha a $80 PreSonus consumer DAC. I wanted to get better SQ and take the laptop out of the chain, although I would lose Audnirvana..
Last edited by wassup; 02-19-2019 at 05:18 AM. Yeah .. the everest is too big for our present living room and literally will blow the doors of the house @ 300w. Even at absurdly high db the everest doesn't even blink. All I can say - the dual ak4497 spec'd with the Japanese preference of pure sound ... its absolutely fantastic. Honestly, I like the nt505 enough that I'd take it with me to audition speakers or compare to other dacs. my other option is to buy a used Lumin D2, again I lose Audnirvana which I really like. Last edited by wassup; 02-19-2019 at 03:57 PM. The Nt505 shows up as Lumin on the ATT Gigapower gateway. I'd take anything with a dual ak4497 set over anything else presently available. I'm not saying the TI or wolfson is bad, but its not in the same league as the 4497. We listen to everything really and I seem to run in cycles with music. Anything from Phil Collins / Genesis. I know most of these catalogs by heart and can quickly identify differences with speakers and/or dacs. I'm not saying one is better or worse, but I can say for certain the nt505 satisfies both my future wife and I (her being the most important). Anyway .. anything musical or with strong vocals. Lady Gaga hires is on my Qobuz playlist atm.. and I'm really enjoying the A Star is Born soundtrack. Her voice is a good test for a dac/amp/speaker much like celine dion or vince gill. Last edited by love_that_sound; 02-19-2019 at 09:14 PM. Give Jakub Orlinski "Anima Sacra" a try, this castrato (contratenore) has a great voice. Highest MQA there is, something like 350kHz, when I listen to it on my Android/UAPP/xDSD/AT-E40 setup at work it is still amazing. Last edited by bobpaule; 02-23-2019 at 03:48 AM. 1) Spotify support: is it just airplay/bluetooth streaming or is it a Spotify connect device? 2) Streamer app: Is it any good? Looks like it was designed in the 90s compared to BluOs. 3) Airplay 1 or 2? 1) TEAC NT-505 show up a the bottom on the Spotify app "Devices available" button on my mobile, so yes it is. 2) Not very good, but the Lumin app replaces it well, it also shows MQA logos. 3. The Iphone 10x plays well with it - no idea which version of airplay it is. you'd need a voltage converter to use it. Japan have a difference in the kind of plug. Please make sure to use a plug that is compatible with the voltage in your country. Hi, everyone. I'm a longtime user of AVS, but unfortunately my account got screwed, so here I am with a new start! I'm an owner of the NT-505 (silver), and it's been a really satisfying week so far! I use it as a Roon endpoint. I'm running Roon an a Synology which is hosting my high-res audio, along with a Qobuz subscription which I've been thoroughly enjoying. The NT-505 integrates SEAMLESSLY into this setup, and the Roon app is great for navigation. It is much more satisfying to use than HR Streamer/Lumin, or anything else I've been messing with. I'm wondering what other owners are doing with regard to allowing the device to upconverting, as well as the filter options. Generally, I've been avoiding them all, but damned if upconverting to DSD256 doesn't have a different (smoother) characteristic to it). What is everyone else doing? Any reason not to have the unit upconvert to it's highest capability (DS512)? What about filters? I can't say I hear a major (any, even?) difference with the filters - so maybe I've answered my own question. But, I'm ever the tinkerer, so I'm curious what you all are doing. I have mine set to wide and dsd512, but I'm also using horns capable of it as well. I don't use roon as the entire premise of me purchasing this nt505 was to avoid yet another needless computer in the chain. I hear you, and I don't think I'd want to use a computer just for Roon either. I run my Roon Core on a Synology NAS. I bought the NAS two years ago for two specific functions: backup and video server. All the Macs in my house back up to the NAS. Synology has a tight integration with Backblaze B2, so for about $6/mo, the NAS sends targeted folders (backups, media, etc.) up to B2 as a secondary offsite backup - which lets me sleep easy at night! As a media server, I had been running Plex on the Synology, so any home movies that I put in a specific folder on the NAS instantly show up on the Apple TV app, and those get backed up as well. So, I had the infrastructure in place when the Teac came along. First I tried Plex, but streaming was not reliable at all. I then went to Minimserver, which streamed smoothly - but I was unimpressed with HRStreamer. So, I just installed the Roon package on the NAS, and that was it for me. So the one NAS serves all those purposes in my home and backs all my media and backups to the cloud - love it! Is there any way you could describe the differences you hear between your upconverting and filter use vs not using them? Does anyone know if this is available anywhere in Canada yet? If not, anyone know when it will be? Click here for pic of my 7.1 home theater system and here for pic of S2 surround wall mounting. Click here for pic of my 2 channel system. Special order only. I found that London Drugs of all places was able to order me one in. Great unit. Excellent dac. How the heck did you even know to ask at a drug store? I looked at their website and see nothing that would even resemble a DAC. I’m in NB and we don’t have London Drug stores anyway. any more NT-505 opinions? sound quality reviews?